I am glad to see from this story that some dangerous chemicals are being eliminated from the British country side. It is a step in the right direction but honey bees (and birds) may be better protected by a ban on cell phone and broadcasting antennas. There is very strong research which links microwave radiation to harm being caused to honey bees. Simon Press, senior technical manager at the Co-op group said: "We believe that the recent losses in bee populations need definitive action, and as a result are temporarily prohibiting the eight neonicotinoid pesticides until we have evidence that refutes their involvement in the decline." Laboratory tests suggest that one of the banned chemicals, imidacloprid, can impede honeybees' sophisticated communication and navigation systems. It has been banned in France for a decade as a seed dressing on sunflowers. Italy, Slovenia and Germany banned neonicotinoids last year after the loss of millions of honeybees. And the European Parliament voted earlier this month for tougher controls on bee-toxic chemicals. Paul Monaghan, the Co-op's head of social goals accused the UK government of failing to recognise that "pesticides could be a contributing factor" in the breakdown of nature's number one pollinating machine. Elliott Carnell, coordinator of Pesticide Action Network (Pan) Europe, said he hoped the Co-op's pioneering stance would persuade the UK government to back the proposed European legislation. "The government has fought against any attempts to protect bees, which pollinate a third of the average diet. It argues that banning pesticides jeopardises crop yields, but if that was the case why would a leading food retailer be introducing this measure?" The pesticide ban is part of the Co-op's 10-point Plan Bee launched today, which includes £150,000 for research into the impact of pesticides on the decline of honeybees in England, where more than a third of hives were wiped out last year. It will also give away bee-friendly wildflower seeds to Co-op members and customers. Three years ago Rob Kaman moved home to Pelham to get out of the industrial atmosphere of Hamilton. He brought his wife Cynthia and their four-year-old son to a rural setting at Canboro Road and Regional Road 24. They opened up Kaman's Auto Service and moved into the house next door. "I didn't want to bring my son up in Hamilton," said the E. L. Crossley graduate. "After 20 years, I felt it was no place to raise a family." In particular, he wanted to get away from hydro and transmission towers that were around his Hamilton apartment building. Much to his surprise, he learned three weeks ago Rogers Wireless Inc. had leased a site at United Floral Distributors across the street to erect a 65-metre-tall Wi-Fi microwave tower. provide Wi-Fi service in the area. In particular, Kaman is concerned about the effects radiation could have on his family and on his neighbours. On Monday, he will present a 27- name petition to Pelham town council asking it to oppose the erection of the tower. He will be part of a delegation commenting on Rogers Wireless towers. radiation from the tower that could go up beside him. He has similarly spent weeks researching on the Internet for studies about the effects of radiation. He questions the purpose of the towers. "Just because someone loses a cellphone call for a minute or so, I'm supposed to put up with a possible risk 24 hours a day seven days a week?" It hasn't been made clear to him whether Rogers has an insurance policy to cover liability if people do become ill because of a tower. At one time health officials had few concerns about smoking or asbestos, then they found out more about the hazardous natures of those matters, he said. Rogers held two January public hearings, one for each tower, at Pelham town hall. The company will prepare a report before it moves on to the next stage in the federal approval process. The public meetings are a new federal requirement for the construction of towers. Although the town has limited authority over the towers, Kaman hopes local pressure may prevent their erection. "I have searched the Internet for something positive about Wi-Fi but I've yet to find it. This is new technology. I think it needs more study." It could take 10 years for brain cancer, leukemia or other illnesses to show up, he said. TV Show about Electrical Hypersensitivity? Protection against Electrosmog. Editor and responsible for the content: Citizens' Initiative Omega, member in the Buergerwelle. Buergerwelle Germany (incorporated society), which works on non-profit base. Our messages are the result of many hours of daily research, roundup and editing. If you would like to support our activity for people around the world with a donation or an aid fund unique or on regular base, you can do it: Recipient: Buergerwelle Germany (incorporated society), bank-connection: Hypo Bank Augsburg, account-No 2250284, BLZ 720 200 70, IBAN: DE83 7202 0070 0002 2502 84, SWIFT (BIC): HYVEDEMM408. Buergerwelle Germany(incorporated society), Umbrella Organization of the Citizens and Initiatives for the Protection against Electrosmog: 1. Chairman Siegfried Zwerenz, 2. Chairman Barbara Eidling, Mailing address: Lindenweg 10, D-95643 Tirschenreuth, phone 0049-(0)9631-795736, fax 0049-(0)9631-795734, e-mail pr@buergerwelle.de, Internet http://www.buergerwelle.de . Thank you. If you need to have translated our message in your language please go to: http://www.freetranslation.com/. This is a free translation service. Mercury in our food supply / Sleep and its relationship with cancer. Mercury in our food supply! Interesting article. This (mercury) could be contributing to heavy metal intake of EHS sufferers. We know from research (and often from our own experiences) that electro magnetic radiation causes severe sleep disruption. Persons who suffer sleep difficulties, are more likely to become ill and develop cancer. In the article below, we learn that if cancer patients do not sleep well after treatment, they are less likely to recover. It seems obvious to me that hospitals should be kept clear of electro magnetic radiation and when patients are sent home, they should be warned to avoid all exposure to EMR. Patients should be warned to avoid cell phones, cordless phones, WiFi, antenna masts and other wireless devices. A patient with cancer faces numerous emotional, physical, and social problems related to the disease and its treatment. That these might impact sleep and waking is not surprising; what may be surprising is the extent to which sleep/wake disturbances impact the patient's life and course of illness. The impact of disturbed sleep is not lost on Kathy P. Parker, PhD, RN, FAAN, the recently appointed dean of the University of Rochester School of Nursing and a nationally recognized sleep disorders researcher. We spoke with Dr Parker recently to find out more about the connections between sleep and cancer. There has been much research on the connection between sleep and the risk of developing cancer, but your work is not quite that, is it? Please tell us about your research. The goal of my research is to improve sleep and waking in patients with advanced cancer. Initially, we examined a sample of patients with advanced cancer in a very methodical, controlled manner so that we could describe quite precisely the nature of the problem. Now, we are exploring the basis for these observations. Once the problem has been described and theoretically explained, one can attempt to predict what would happen if you change a variable to ultimately improve the outcome. It seems to me that there are both quality of life and deeper health issues related to sleep disorders. Can you discuss each and their importance? How does poor sleep quality impact the course of cancer development and treatment? Fundamental human needs must be met in order to optimize quality of life. Most people are aware of the importance of proper diet and exercise, but the crucial role that sleep plays is less well appreciated. However, poor sleep has important and negative effects on life quality. Sleep loss actually affects brain functioning and alters the waking experience. By improving the quality of sleep in patients with cancer, their quality of life can improve even though the underlying problem cannot be changed. Poor sleep quality and short sleep duration have been associated with increased mortality. The results of 1 study suggested that cancer patients with poorer sleep had poorer outcomes compared with those who slept well. Much work remains to be done in this population. However, we know from work in healthy populations that poor sleep is associated with a large number of health problems and patients with cancer are susceptible, and perhaps more vulnerable, to the same problems. How do you separate the idea of sleep-related disorders from the fuller spectrum of cancer symptom clusters? Many of the sleep disorders in cancer patients are related to more than one issue, such as fatigue, pain, depression, anxiety, etc. This is an area which I am currently examining. Depression, fatigue, and pain are common complaints of cancer patients. Poor sleep is also frequently reported. Whether sleep is part of this cluster of symptoms, or represents a common mechanism causing the symptoms to occur together is not well understood. Much previous work has examined a single symptom and not symptom clusters. Part of the problem in studying symptom clusters is the overlap often found in the instruments used for their measurement. This challenge can be addressed using special statistical techniques. Are there differences in sleep disturbances between patients being treated as outpatients and inpatients? If a patient has an underlying sleep disorder, that problem will be present whether he/she is an in- or outpatient. Most individuals who are admitted to the hospital will have disturbed sleep due to the environment, stress, pain, and frequent interruptions. New or different medications may also disturb sleep. Do particular types of cancers cause greater difficulties with sleeping? The type of cancer is likely to be important because of the underlying pathophysiology. However, few studies have been conducted in this area and those that have been done contained small sample sizes. In a study of 114 patients (using polysomnography as the primary measure), we found that patients with lung cancer had more severely disturbed sleep than those with other types of cancers. There is some other work that also suggests lung and breast cancer patient may be more at risk. Clearly, this is a question that remains to be fully explored. Nonetheless, given the prevalence of sleep problems in cancer patients, it behooves the practitioner to explore sleep with them, especially in any kind of palliative care programs. Are there demographic differences among patients with cancer-related sleep disorders? There seem to be. In my own work, women have better sleep than men, whites have better sleep than nonwhites, those that have a higher education level did better than those with a lower educational level, and those who lived with another person had greater amounts of sleep than those who lived alone. These findings are very consistent with the demographic differences in the general population. What do nurses need to know about sleep disorders in patients with cancer? How should these be evaluated? An understanding of the importance of sleep and the impact of poor sleep can be obtained through self-study and educational programs. However, listening to patients is key. Unfortunately, cancer patients frequently do not bring up sleep issues because caregivers may not pursue the problem with them or do not know what to do about it. It is important to evaluate a patient's sleep in terms of quantity and quality, and to explore whether the problem involves nocturnal sleep, daytime sleepiness, or both. It is very helpful to talk to the patient's bed partner. Prolonged insomnia, significant snoring or breathing pauses, restlessness or kicking at night, are all problems that may require a referral to a sleep specialist. Are particular periods in any cancer's course of treatment always worth paying attention to? The available data suggest that sleep problems may present in cancer patients before the disease is actually diagnosed. Sleep problems are also often reported with chemotherapy, radiation therapy, and surgical therapy. Pain medications, including opioids, can disrupt nocturnal sleep and cause daytime fatigue and sleepiness. Let's talk more about opioids. Why would one need to worry about sleep problems in patients taking these? In my research, I've found that patients taking opioids had increased light sleep and less deep sleep. Other work in this area has shown that opioids increase nocturnal arousals and reduce both deep sleep and rapid-eyemovement (REM) sleep. Whether this occurs only in the short- as opposed to long-term is not well described. Daytime sleepiness may also be a significant problem for those taking opioids. How did you get started in nursing, and how did you arrive at your present area of research interest? I decided to become a nurse after being hospitalized for a kidney infection when I was about 5. I was cared for by a wonderful nurse and wanted to be just like her. I became interested in sleep during the years I was a nurse practitioner. Sleep was a tremendous problem for many of my patients and I suspected that medications and/or treatments might be contributing factors. In one research project, for example, we found that lowering the temperature of the dialysis bath used during hemodialysis helped patients sleep better. This sleep-promoting intervention was based on the fact that the body temperature has to drop in order to have optimal sleep. With this, we provided a simple, costeffective, nonpharmacologic intervention, and I became interested in doing that for cancer patients for the same reasons. Your work has focused on translational science is that because it is possible to impact patient care more quickly? Yes, more quickly and perhaps more effectively. Translational research is a natural offshoot of nursing. You're presented with a patient problem, and you go back and look at it to try to address and control it. It's kind of inherent in the way nurses think. In August 2008, you were named the dean of the University of Rochester School of Nursing. What are your plans for the school and the nursing curriculum? I am very committed at this stage of my career to developing nursing as a profession and preparing the nurses of the future. I've been a nurse for more than 30 yearsa clinician, an educator, a researcher, and an administratorand I felt that it was time to focus on developing others and making a difference in nursing. This is a wonderful opportunity for me to do that. Do you have any advice for the newly minted oncology nurse? I really don't have a lot of down time. But I do have a bedtime ritual, and this is something I think everyone should have. In order to sleep optimally, it helps to have a routine that gets your mind conditioned to going to bed. So, for example, a ritual might be showering, getting in your bedclothes, brushing your teeth, and reading for a while. This is helpful in cueing the mind to slow down. You want to avoid things that are very activating, such as bringing work to bed. You need to have a period where you're unwinding, which is very healthy. US PRESIDENT Barack Obama has turned to a Midland anti-mobile phone mast campaigner to help the fight against cancer. Eileen O'Connor, as a founder member of the Radiation Research Trust, has led the battle against the relentless growth of mobile phone masts and technology for the past seven years. And now the US President's cancer panel, set up by Obama to research the possible links with both nuclear and electro-magnetic radiation, has asked Eileen for her views on the issue. Eileen said: "Obama's panel has launched an information gathering exercise and I was invited to provide evidence. While I am not building up my hopes, I am delighted the issue is being taken seriously by the President. "President Obama recently said science is about ensuring that facts and evidence are never twisted or obscured by politics or ideology. "It's about listening to what our scientists have to say, even when it's inconvenient and I welcome this approach." The article, "Company recalls LG 150 cellphones", by Chris Sorensen (Toronto Star, January 28, 2009) clearly indicates that Health Canada is no longer in the business of protecting the health of Canadians. The "voluntary" recall by LG Canada was a responsible reaction to their cell phones exceeding federal guidelines for microwave emissions. The statement by Health Canada, namely that "the past and present use of the LG 150 should not pose immediate or long-term health concerns" is clearly irresponsible. This statement comes in sharp contrast to the warnings from other countries to restrict cell phone use, especially by children, and in sharp contrast to a growing number of countries reducing their maximum exposure limits based on scientific studies showing an increased risk of tumors after 10 years of moderate to high cell phone use. Why do we have these guidelines if they are not enforced? Why do other countries have guidelines that are much lower than those in Canada? Why is Health Canada more concerned about protecting the health of the cell phone industry than it is about protecting the health of Canadians? At what stage should the name of Health Canada be changed to reflect what it is truly doing . . . protecting the interests of big business? Preteens participating in an unusual interactive simulation were more likely to suffer a virtual accident if they talked on the phone while they were crossing a street, researchers have found. 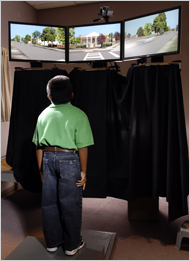 A child trying to gauge his progress at a simulated street crossing. Children do considerably worse on the test when talking on cell phones, researchers have found. Children aren't the most skilled street-crossers to begin with, researchers said. But in the simulation, talking on the phone increased the odds of being hit or almost hit by a virtual car from 8.5 to 12 percent, a 43 percent increase in risk. The report was published in the February issue of the journal Pediatrics. The study comes on the heels of several others that have shown that talking on the phone takes a toll on the attention and visual processing skills of drivers, and may increase the risk of an automobile accident four-fold. "Crossing the street is very complicated, if you stop and think about it," said senior author David C. Schwebel, an associate professor of psychology at the University of Alabama at Birmingham. Preteens aren't able to do it nearly as well, he said, when talking on the phone. Dr. Schwebel and his colleagues placed 77 children in a virtual reality environment that mimicked an intersection, standing across the street from a school with cars passing by in both directions. Researchers asked the 10- and 11-year-olds to decide when it would be best to cross. The children stepped off a platform roughly the height of a sidewalk curb when they thought it was safe. Each child made a dozen virtual street crossings, half while talking on cellphones. About half of the children were talking during their first six crossings, while the other half received calls during the second six crossings. Although performance improved with time and practice, the psychologists found, the phone calls distracted the children, making them less attentive to traffic. While on the phone, they more often hesitated before stepping off the virtual curb and left themselves too little time before another car drove by, leading to more close calls and more collisions. The virtual environment did not imitate life in one important way: it did not allow for children to pick up the pace and run across the street, nor could a car slam on the brakes or swerve to avoid an accident, Dr. Schwebel said. On the other hand, using a cellphone wasn't new to any of the children, Dr. Schwebel noted. All of them had used the phones before. "If you're a parent, you should probably tell your kids not to be texting or talking on the phone, or listening to an iPod for that matter, when crossing an intersection," said David Strayer, professor of psychology at the University of Utah in Salt Lake City and an expert on cellphone safety. "This is consistent with what we know about how the mind works when people are driving," Dr. Strayer added. "You do need your mind to navigate through the world, whether you're biking or driving or rollerblading or walking." Please see the important attached letters and base station research information. We kindly request you to reply latest on February 11, 2009. MISSISSAUGA, Ont. -- LG Electronics Canada Inc. is recalling its LG 150 mobile phone after being told it is no longer certified as meeting Industry Canada's standards for radio-frequency devices designed to be used near the human body. The South-Korean based electronics manufacturer said Tuesday it has issued a voluntary recall for the phone, the only one its makes that is affected by the announcement. "LG has mobilized quickly in response to these findings on behalf of our customers," LG Electronics Canada president William Cho said in a statement. "LG's preliminary testing indicates that only LG 150 phones from specific production runs may be affected by this issue." While the issue affects only some of LG's 150 model phones, Cho said the company is recalling all of them in "a proactive approach" to the recall. While the standards are put in place to protect users from the potential hazards of radio waves -- a form of electromagnetic radiation -- the phone does not pose any immediate danger to users, LG said. "Health Canada is of the opinion, based on the review of test results and its assessment of current science, that the past and current use of the LG 150 should not pose immediate or long-term health concerns," the company said. Customers with the phone can contact their carrier in to exchange it with a comparable phone free of charge until March 31, LG said. Carriers such as Bell Mobility, Virgin Mobile and MTS Allstream have said they will support the recall. Owners of the phone can visit LG Canada's website at www.lg.ca/lg150 or call 1-866-940-6580. Virgin Mobile Canada: 1-866-857-7450 or www.virginmobile.ca/lg150. Much of the research related to residential electric and magnetic field exposure focuses on cancer risk for children. But until now only little knowledge about coupling of external transient electric and magnetic fields with the child's body at low frequency transients existed. In this study, current densities, in the frequency range from 50 Hz up to 100 kHz, induced by external electric and magnetic fields to child and adult human body, were investigated, as in residential areas, electric and magnetic fields become denser in this frequency band. For the calculations of induced fields and current density, the ellipsoidal body models are used. Current density induced by the external magnetic field (1 µT) and external electric field (1 V/m) is estimated. The results of this study show that the transient electric and magnetic fields would induce higher current density in the child body than power frequency fields with similar field strength. Some epidemiological studies in the past stated the existence of positive associations between cancer and leukaemia, occurring in children and the configuration of nearby residential electric power lines, often referred to as 'the wire code'(1,2). Several reports on this subject have appeared since Wertheimer and Leeper(1) who first pointed out the possibility of an association between childhood mortality due to cancer and proximity of homes to power distribution lines with what is called 'high current configuration'. So far, there have been more than a dozen studies on childhood cancer and its possible causes by exposure to power frequency magnetic fields produced by nearby power lines(1,3–7). The fact that the results for leukaemia that were based on proximity of homes to power lines had been relatively consistent led the U.S. National Academy of Sciences (NAS) Committee to conclude that children living near power lines appear to be at increased risk of leukaemia(8). Over the years, there has also been substantial interest in whether there is an association between magnetic field exposure and childhood brain cancer, the second most frequent type of cancer found in children. However, the recent studies completed after the NAS Committee's review fail to provide support for an association between brain cancer and children's exposure to magnetic fields and also, whether the source was power lines or electric blankets. It is also not clear from the report whether magnetic fields were estimated by calculations or by wire codes(5,9,10). The most intensively investigated environmental factor has been the time-weighted average magnetic fields associated with electric currents on power lines and grounding systems. A large U.S. Case Control Studies to test whether childhood acute lymphoblastic leukaemia is associated with exposure to 60-Hz magnetic field was published by Ref. (4). According to some workers in this field(11–13), the power lines were the most important source of exposure when the magnetic field due to line was greater than 0.2 µT. The result of the study indicated that children who lived close to a power line had a higher magnetic field exposure than other children. Most of the research in this area has been associated with power frequencies and there are relatively few publications in the frequencies associated with transient fields and these are mostly studies of characteristic compositions of these fields. In recent years, research has been conducted to characterise transient electric and magnetic fields in residential areas(14–16). Transient fields in residential environments depend on the electric power lines, grounding systems, switch-gear and wire codes. According to Ref. (15), homes in urban areas had more transients than homes rural areas. Hence, the response of the system to a transient input signal, f(t), can be obtained by understanding its response to a sinusoidal input with frequency spanning 'frequency content' of the transient signal. The present study analyses whole-body exposure of homogeneous ellipsoids shaped child models to uniform sinusoidal electric and magnetic fields with frequency up to 100 kHz. This frequency range was chosen as it is the practical upper limit for dosimetric concern because of the time constants (>10 µs) inherent to biological signalling within cell membranes(2). The International Commission on Nonionizing Radiation Protection (ICNIRP) general public reference level for induced current Jrms is specified as 2 mA m–2 in the frequency range 4 Hz to 1 kHz, and f/500 mA m–2 in the frequency range 1–100 kHz (where f is the frequency in hertz)(18). The interaction of time-varying electric fields with the human body results in the flow of electric charge (i.e. electric current, the polarisation of bound charge, formation of electric dipoles), and the reorientation of electric dipoles already present in tissue. The relative magnitudes of these different effects depend on the electrical properties of the body (i.e. its electrical conductivity and permittivity). Electrical conductivity and permittivity vary with the type of body tissue and also depend on the frequency of the applied field. External electric fields induce a surface charge on the body. The results obtained for induced currents in the body and for the distribution of these currents depend on the exposure conditions, size and shape of the body, and on the body's position in the field. The physical interaction of time-varying magnetic fields with the human body results in induced electric fields and circulating electric currents. The magnitudes of the induced fields and the current densities are proportional to the radius of the loop, the electrical conductivity of the tissue and the rate of change and magnitude of the magnetic flux density. For a given magnitude and frequency of a magnetic field, the strongest electric fields are induced where the loop dimensions are the greatest. The exact path and magnitude of the resulting current induced in any part of the body will depend on the electrical conductivity of the tissue. where x, y and z are rectangular coordinates, and the size and shape of the ellipsoid are determined by the three parameters a, b and c where c b a. A basic ellipsoid child model is shown in Figure 1. When using an ellipsoid to model a person, 2a defines the person's height, 2b defines the person's width (measured from hip to hip) and 2c defines the person's 'depth' (measured approximately from the surface of the abdomen to buttocks). Table 1 gives the values of a, b and c in the ellipsoid models of children of various ages and average man(20). Conductivity and dielectric constant of the selected homogeneous body model for various frequencies can be seen in Table 2(20). Figure 1. Ellipsoid models representation: (a) magnetic field is aligned with the major axis of the body (B0//a), (b) magnetic field is aligned with the intermediate axis of the body (B0//b) and (c) magnetic field is aligned with the minor axis of the body (B0//c). Table 1. Ellipsoid parameters for selected body models. Table 2. Electrical properties of homogeneous body models. where F( , k) and E( k) are the incomplete elliptic integrals of the first and second kinds, respectively, and k is the modulus of these elliptic integrals. When the external electric field is vertical to the body, the induced electric field becomes maximum. For other orientations of external electric fields, mathematical details can be seen in the open literature(21). where is the electrical conductivity of the human model. Interactions of 50/60 Hz magnetic fields with a biological body can be considered, for the wavelength of the magnetic field is much larger in comparison to the size of the biological body. It can be shown from Faraday's and Ampere's laws that the secondary magnetic field produced in a biological object by the current flow induced by the external magnetic field can be neglected. So the magnetic field inside the biological body is considered uniform(22). Table 3 depicts the calculated induced current densities when the ellipsoidal models are exposed to 1 V/m external electric field. Table 4 depicts the calculated induced current densities when the ellipsoidal models are exposed to 1 µT external magnetic field. Figure 2 depicts results of the maximum induced current density in different body models versus different external magnetic field orientations for frequency of 50 Hz. Induced current density in all body models is the maximum for B0 aligned with c on z axis. Table 5 shows calculated maximum induced current densities inside the ellipsoidal models exposed to 1 µT magnetic field for orientation of B0//b. Table 6 depicts maximum induced current densities for the external magnetic field vertical to the body (B0//a). Figure 2. Results of the maximum current density values Jmax [µA/m2 /(µT)] in different body models for frequency of 50 Hz. Table 3. Induced current density in body models by external electric field density value of 1 V/m which is vertical to the body. Table 4. Induced current density in body models by 1 µT external magnetic field which is perpendicular to front of the body. Table 5. Induced current density in various body models by 1 µT external magnetic field which is perpendicular to the side of the body B0//b. Table 6. Induced current density in body models by 1 µT external magnetic field which is vertical to the body B0//a. Table 7. Induced current density in body models by 1 µT external magnetic field which is perpendicular to front of the body. In this paper, for ellipsoidal body models, with 1 µT magnetic and 1 V/m electric field exposure, induced current densities have been analysed. Results vary with the orientation of field or the size of body. When the external magnetic field is applied in parallel to the long axis of body (B0//a, i.e. aligned with the long axis of the body), induced current density to the body is less than other field-body configurations (B0//b and B0//c). As a result, induced current density may vary with shape and size of the body, exposure frequency and the orientation of the body relative to the field. Figure 2 and Tables 3–7 summarises the current densities in children's and adults' body when they are subject to external electric and magnetic fields. It is also easy to compare the exposures for field orientations. At exposure frequency, the induced current density varies in relation to the field orientation and the body models. The size and the shape of the body as well as the field orientation are the major parameters for induced current prediction. The band of frequencies chosen for this study was between 50 Hz and 100 kHz. In this way, the densities of electrical currents induced in the body models of children and adults by the magnetic fields caused by the power frequencies and the frequencies contained in transient sparks were investigated. Transient fields may contain all three components of the magnetic field as well as at least one of the components of the electric field. In residential homes, these magnetic fields affect all the people living within. In bedrooms, these components of the fields may be parallel as well as perpendicular to the children's beds. The analysis indicates that the maximum induced current density occurs when the electric field component is parallel to the major axis of the body. In contrast, the induction of highest current density occurs when the external magnetic field component is parallel to the minor axis of the body. The results show that the transient electric and magnetic fields would induce higher current density in the child body than power frequency fields with similar field strength. At this point it should be mentioned that frequency of external field appears to be an important parameter of the exposure as the induced current density increases with the frequency. Therefore the transients are of particular interest because they would induce higher current density in child body than power frequency fields with similar field strength. Induced current values of 75 and 100 nA/cm2 were found on chest and abdominal areas of the anatomical man model (ungrounded), respectively, in the measurements which were performed at 60 Hz, 10 kV/m(25). Calculated values of current densities in this study, 72.2 nA cm–2 in 50 Hz, 10 000 V/m (Table 3), are in good agreement with measured values. Although the main aim of this study is not comparison of induced current densities with safety guidelines, current densities induced by 1 µT magnetic field and 1 V/m electric field stay under the basic ICNIRP restrictions. The research is supported by the Research Project Department of Akdeniz University, Antalya, Turkey. The author is grateful to Prof. Dr. Ender Olcayto for his valuable discussions and suggestions. National Academy of Science/National Research Council. Possible health effects of exposure to residential electric and magnetic fields (1996) Washington, DC: National Academy Press. Day N. Exposure to power frequency magnetic fields and risk of childhood cancer. The Lancet (1999) 354:1925–1931. Guttman J. L., Zaffanella L. E. Survey measurements and experimental studies of residential transient magnetic fields. (1994) Palo Alto, CA: Electric Power Research Institute. EPRI Report TR-104532, Research Project RP 3349-01. Deadmen J. E., Camus M., Armstrong B. G., Heroux P., Cyr D., Plante M., Theriault G. Occupational and residential 60 Hz electromagnetic fields and high-frequency electric transients: exposure assessment using a new dosimeter. Am. Ind. Hyg. Assoc J (1996) 57,:508–583. Mathews J., Walker R. L. Mathematical methods of physics. (1965) New York, NY: W.A. Benjamin, Inc.
ICNIRP. Guidelines for limiting exposure to time-varying electric, magnetic, and electromagnetic fields (up to 300 GHz. Health Phys (1998) 41:449–522. Durney C. H., Mussoudi H., Iskender M. F. Radio frequency radiation dosimetry handbook. (1986) 4th ed. TX: United State Air Force, School of Aerospace Medicine. Brooks Air Force Base Report USAFSAM-TR-85-73. Hart F. X., Marino A. A. ELF dosage in ellipsoidal models of man due to high voltage transmission lines. J. Bioelectr (1982) 1:313–328. Reilly J. P. Electrical stimulation and electro pathology. (1992) Cambridge, UK: Cambridge University Press. Kaune W. T., Kistler L. M., Miler M. C. Comparison of coupling of grounded and ungrounded humans to vertical 60-Hz electric fields. In: Interaction of Biological systems with Static and ELF Electric and Magnetic Fields—Anderson L. E., Kelman B. J., Veigel R. J., eds. (1987) Springfield, VA: National Technical Information Services. Publications CONF-841041, UC-97a.